An electric vehicle charging station is a component or an infrastructure which supplies electric energy to the electric vehicles for recharging of batteries at home or at public spaces. It provides energy to plug-in electric vehicles which includes electric cars and plug-in hybrids. An electric charging station is also known as electric vehicle supply equipment (EVSE). Charging equipment can be differentiated on the basis of charging time and the usage. In the last few years, the demand for electric vehicle charging stations has accelerated in response to the increased sales of electric vehicles (EV). Besides the growing awareness about benefits these vehicles provide, the market is gaining from favorable government policies. For instance, governments have introduced various subsidies to promote the sales of electric vehicles. These may include road tax exemption. Also manufacturers are working on lowering their production cost to offer advanced models of electric vehicles under a reasonable price tag. While these strategies are aimed towards promoting EV sales, the electric vehicle charging station market will as well gain from them. 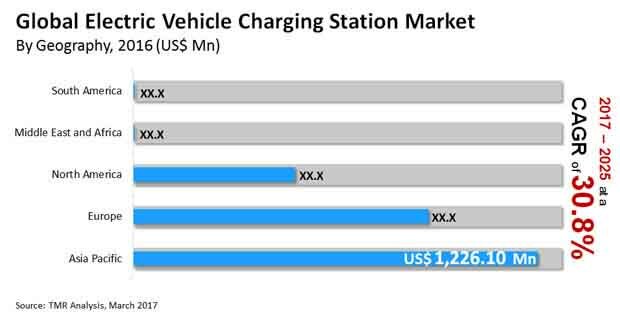 The global electric vehicle charging station market is therefore expected to showcase an exponential CAGR of 30.8% between 2017 and 2025. At this pace, the market’s valuation will reach US$37.48 bn by the end of 2025. The electric vehicle charging stations market can be broadly classified under technology, end-use application, and geography. Based on technology, the market is segmented into level 1, level 2, and level 3. Of these, the adoption of level 2 charging stations has been the highest in the last few years. These stations perform faster than their predecessor level 1 and is cheaper than more advanced level 3 charging stations. Considering this, the demand for level 2 charging stations is expected to continue accelerating through the forecast period. However, level 3 charging stations are gaining popularity as the market gears to embrace technological advancements in the near future. In terms of end-use, the market is classified into government, public space and municipalities (parks and street), commercial office space, healthcare, retail, hospitality, residential, logistics and transportation (fleet services), education, and others. Of these, the residential sector emerged dominant in 2016. By the end of 2017, it is expected to hold over 41.6% of the market. As the rate of sales of EVs across the household sector increases, the demand for charging stations to be installed at residences is likely to rise in response. While the commercial office space and retail segments are anticipated to generate higher revenue in the coming years, it won’t be easy for them to outpace the residential sector. Regionally, the global electric vehicle charging station market can be segmented into North America, South America, Europe, Asia Pacific, and the Middle East and Africa. Among these regions, Asia Pacific emerged dominant in 2016 and is expected to remain at the fore over the course of the forecast period. The primary drivers of the electric vehicle charging station market in Asia Pacific region are improving infrastructure along with the favorable government regulations and growing environmental awareness. North America and Europe regions are anticipated to experience promising growth in the electric vehicle charging station market during the forecast period. However, the Middle East and Africa is expected to report the highest CAGR of 61.6% between 2017 and 2024. Some of the leading players operating in the global electric vehicle charging station market are AeroVironment, Inc., Bosch Automotive Service Solutions Inc., ChargePoint, Inc., ClipperCreek, Inc., Delta Group, Eaton Plc, Enel Group, E-Station Pty Ltd., General Electric Co., Hitachi, Ltd., KYOCERA Corp., Leviton Manufacturing Co., Inc., Nichicon Corp., Panasonic Corp., Schneider Electric SE, SemaConnect, Inc., Siemens AG, Signet Systems Inc., Tesla Motors, Inc., Toyota Industries Corp. The electric vehicle charging station market report provides analysis for the period 2015–2025, wherein the period from 2017 to 2025 is the forecast period and 2016 is the base year. The report covers all the major trends and technologies playing a key role in electric vehicle charging station market growth over the forecast period. It also highlights the drivers, restraints, and opportunities expected to influence market’s growth during the said period. The study provides a holistic perspective on the electric vehicle charging station market’s growth throughout the above mentioned forecast period in terms of revenue and volume (in US$ Mn and Thousand units), across different geographies, including Asia Pacific, South America, North America, Europe, and Middle East & Africa (MEA). The report also highlights the competitive landscape of the electric vehicle charging station market, thereby positioning all the major players according to their geographic presence and recent key developments. The comprehensive electric vehicle charging station market estimates are the result of our in-depth secondary research, primary interviews, and in-house expert panel reviews. These market estimates have been analyzed by taking into account the impact of different political, social, economic, technological, and legal factors along with the current market dynamics affecting the electric vehicle charging station market’s growth. The market overview section of the report demonstrates the market dynamics and trends, such as the drivers, restraints, and opportunities that influence the current nature and future status of this market. An attractiveness analysis has also been provided for every geographic region in the report, in order to give a thorough analysis of the overall competitive scenario of the w electric vehicle charging station market, globally. Moreover, the report provides an overview of the various strategies of key players present in the market. Product definition and introduction chapter helps in understanding different technologies of electric vehicle charging station along with their applications which are included in the report. The report segments the global electric vehicle charging station market on the basis of technology into level 1, level 2, and level 3. By end-use application, the market has been classified into government, public space and municipalities (parks and street), commercial office space, healthcare, retail, hospitality, residential, logistics and transportation (fleet services), education, and others. Thus, the report provides in-depth cross-segment analysis of the electric vehicle market and classifies it into various levels, thereby providing valuable insights at the macro as well as micro levels. On the basis of country, North American market is divided into The U.S., Canada and Mexico. Similarly, Europe market is divided into The U.K., Germany, France, and Rest of Europe. Asia Pacific has been segmented into China, Japan, Australasia, and Rest of Asia Pacific. Middle East and Africa covers the GCC, South Africa and Rest of Middle East and Africa. Similarly, South American region includes Brazil, and Rest of South America. This report provides all the essential information required to understand the electric vehicle charging station and its components. Also, the report provides insights related to the policies and regulations according to the various geographical regions mentioned above. These policies and regulations are directly or indirectly influencing the electric vehicle charging station market. Furthermore, Porter’s Five Forces analysis explains the factors which are currently affecting the electric vehicle charging station market. This report also provides the value chain analysis for the electric vehicle charging station which explains the participants of the value chain. AeroVironment, Inc., Bosch Automotive Service Solutions Inc., ChargePoint, Inc., ClipperCreek, Inc., Delta Group, Eaton Plc, Enel Group, E-Station Pty Ltd., General Electric Co., Hitachi, Ltd., KYOCERA Corp., Leviton Manufacturing Co., Inc., Nichicon Corp., Panasonic Corp., Schneider Electric SE, SemaConnect, Inc., Siemens AG, Signet Systems Inc., Tesla Motors, Inc., Toyota Industries Corp. are some of the major players operating within the global electric vehicle charging station market profiled in this study. Details such as financials, SWOT analysis, business strategies, recent developments, and other such strategic information pertaining to these players have been duly provided as part of company profiling.